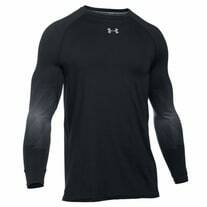 Hockey performance apparel has become more and more popular every year. Players don't just wear cotton socks and a plain white undershirt anymore; in order to have a competitive edge, you need every piece of material on your body to be lightweight, breathable and durable. Hockey performance apparel, such as shirts, pants and socks, is constructed with moisture wicking materials that keep your body cool and dry all game long so that you aren't carrying extra water weight throughout the game. The materials are also non-abrasive to minimize chafing and discomfort from direct skin contact with your gear, and some pieces of hockey performance apparel, such as shirts, also have grippy material on the elbows and shoulders to keep your shoulder pads and elbow pads locked in place to reduce slippage. Our selection of performance apparel products includes performance skate socks, long sleeve and short sleeve performance shirts, performance shorts and pants and full body performance suits. Bauer, Reebok, Easton, Under Armour, Shock Doctor and Warrior are just a few of the hockey under apparel brands that we carry at Hockey Giant.